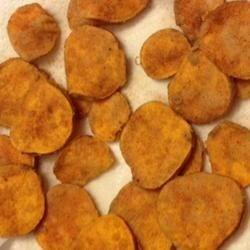 "I made this up after I could only find baked sweet potato chips on Allrecipes. (Those are great, too, but I was already frying fish and wanted some nice crunchy chips.) These are crisp, delicious, and easy. Don't sweat the measurements. I just eyeballed it, and you can too. Mix the seasoning to your own taste." Mix sweet potatoes and milk together in a bowl. Mix flour, 1 tablespoon sugar, 1 teaspoon cinnamon, ginger, and 1/2 teaspoon salt together in a separate bowl. Remove a few sweet potato slices at a time, allowing excess milk to drip offl; dip the slices into the flour mixture. Place the coated sweet potatoes on a plate. Repeat with remaining sweet potatoes. Heat vegetable oil in a large skillet over medium-high heat. Combine 1 teaspoon sugar, 1/2 teaspoon cinnamon, and 1/4 teaspoon salt in a small bowl. Fry the coated sweet potatoes, working in 2 to 3 batches, until crisp, 5 to 7 minutes. Drain chips on a paper towel-lined plate. Sprinkle with cinnamon-sugar mixture. Check out this cool way to make potato chips! Really good! used mandolin to slice and fried in coconut oil and they crisped up nice.